Mammals are craiturs that gies milk tae thair affspring. A mammal haes wairm bluid an a rig-bane. Cats, mice an sicna mammals bides on laund an selchs an whauls an sicna mammals bide in the sea. Awmaist aw mammals gie birth tae leevin young. 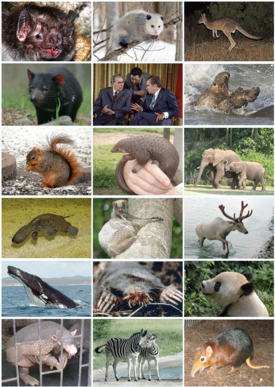 Thare are anerly twa mammals that lay eggs, cried Monotremes, the Deuk-nebbed Platypus Ornithorhynchus, an the Spiny Anteater Echidna, wi fower speshies. Aw are confined tae Australie an New Guinea, an are the sole survivors o earlier kynds o mammal. Ither mammals are sindert intae the Marsupials an the Eutheria, the placental mammals. Marsupials are mammals wi pootches for tae cairy young in, lik the kangaroo. Aw ither mammals are Eutheria. Wikimedia Commons haes media relatit tae Mammalia. This page wis last eeditit on 15 Februar 2017, at 03:16.